Last week I had the pleasure of singing with the Women of Heartsong choir for a group of elderly residents at a retirement home here in town. We meet on Monday evenings and one Monday each month is devoted to bringing music to retirement homes and assisted living facilities. This most recent performance for the residents at Buckner Villas was a very special experience. The Winter Holidays are full of emotion. Rarely do we experience during such a small time frame, the roller coaster ride of excitement (presents! ), frustration (parking at the mall), joy (families gathering together), stress (again…families gathering together), and the bitter-sweet nostalgia of days gone by as we do at this point in the year. “Time to go, time to go, time to put on shoes! Or how about having some fun with a kitchen play-along? Get out those pots and pans, Tupperware containers, and wooden spoons and turn up the music! You may find that a kitchen floor jam session was just what you needed to unwind from a crazy trip to the grocery store. Remember that you are the most important musical role model in your child’s life. When you sing with your child, you’re giving her a very important gift that only you can give-the foundation for a lifetime of music making and appreciation! 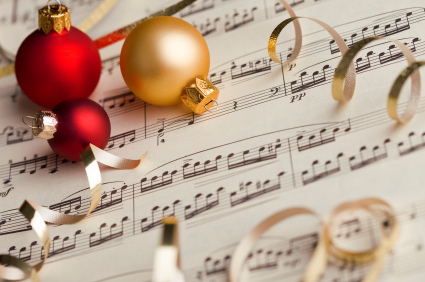 Whatever you do, have a safe and happy holiday enjoying the sounds of the season! Summer is over as everyone heads back to school, right? Wrong! Well, half of that is completely untrue for us Austinites. Even though our “fall” schedules tell us it’s over, the heat of summer is going nowhere fast. If you’re in need of some fun ways to beat the heat and survive the sticky, icky, moody late afternoons and weekends, let music be your guide! I have two words for you: DANCE PARTY! This is a highly underrated, useful activity that can be done indoors, yet can be incredibly active, burning off energy, and elevating mood for grownups and kids alike. Parents, as we constantly say to you in class, the more fun you’re having, the more fun your little one will have. Get nostalgic with your song selection; have fun creating a special dance party playlist, bust out your favorite hip hop from high school, or the songs you danced to at your wedding, then push the coffee table out of the way, close the curtains, turn up the AC, and let loose! If you’re head-banging or tush-pushing around the living room, having a silly blast, there’s no way your babies, toddlers, and preschoolers won’t have a great time watching—and most likely will be inspired to join in, too! Along similar lines is a jam session. We do this in class every week with our play-along ritual, but make no mistake; this can be just as active an experience as the dance party if you let it. Again, you’re the leader. While setting your kid in a pile of instruments, putting on their favorite music can be great, it is much more engaging if you’re actively involved too. Sometimes (when they let you), you be the DJ and play your music and go nuts on that bongo like you’re the drummer from Def Leppard. Some other ideas for jamming are: use kitchen wares or unexpected toys as instruments, get crafty and make your own instruments, be a parade and march around the whole house, or find a spot in front of a mirror and make silly, intense jam-faces. Like the dance party, this can last a good long while if you’re having fun too, and can use up some necessary end-of-the-day energy when the park is a no-go. Another idea is: water play!! Of course this can be outdoors, in the pool or sprinkler, but you can make a fun water play station inside on those days you can’t bare to go out again. Perhaps you run an early or extra bath (in swimsuits?!? ), maybe you bring chairs or stools to the kitchen or bathroom sink, or put towels or a blanket down on the floor and get out a big kitchen bowl or laundry tub and fill it with water! Most of our Music Together collections have at least one song about water, like “I Had a Little Frog” from the summer collection, or “Canoe Song” that we’ll be doing in the Fall Session. Rhythmically splash and sing along to these of course, but honestly, any song can be a water song! If “Ridin’ in the Car” is still a favorite—make it about a boat instead of a car. If one of the many train songs pops into your head—pick up all the water dwelling animal bath toys you have and train them around the water. These ideas are fairly simple, and require nothing but tools you already have, mostly being: you. Remember this on these endless sweltering days and beat the heat with music!